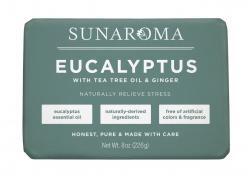 Sunaroma’s Eucalyptus Soap will melt away stress and clear your mind! It’s all thanks to the fact that it’s made with natural ingredients like Eucalyptus Essential Oil, Tea Tree Oil and Ginger. Together they calm skin, ease inflammation and provide a cool, refreshing feeling.